Are you glad it’s the weekend? I’ve just finished a big 4 week project for my day job. This weekend I’m catching up on a few things at home before I fly to Sydney early next week. It’s also the last week of summer here in Australia, and I’m looking forward to the start of autumn and cooler weather and my birthday. Fun times! I have a question for you: What would be your dream vacation if you had an unlimited budget to visit Australia? Tourism Australia put together an ad for the Superbowl. You may have seen it? Did the ad fit your expectations of Australia? Would it entice you to visit Australia? If you’ve visited Australia, what did you think of my beautiful country? If you’re an Aussie (waving to Wemble and our Aussie reader friends): What’s your top holiday destination in Australia? On Valentine’s Day Ginger launched our brilliant Birthday Bash. 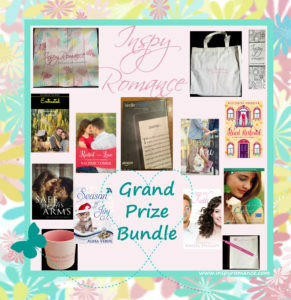 The lucky Grand Prize winner will be able to snuggle up with the throw and their favorite beverage in a pretty Inspy Romance mug. 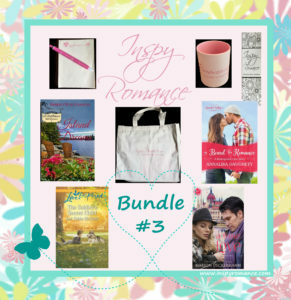 In their Inspy Romance tote they’ll have a notebook, a selection of inspy romance print books, and the Voyager! A fabulous reading experience for the winner of the Grand Prize Bundle! There are 10 prize bundles to be won – 4 print book bundles – 4 ebook bundles – 1 international print book bundle (for our international reading friends who live outside the US) and the Grand Prize bundle! Every comment you write on our blog posts during the giveaway period (2/14-3/16) will give you an entry in the drawing. Check out our 2018 Birthday Bash Giveaway Page for the terms and conditions and the full list of prizes. Liwen Y. Ho’s winner is Lisa Phillips! Lee Tobin McClain’s winners are Debra Gray-Elliott and Elizabeth and Katie Anderson! 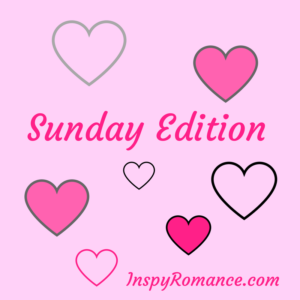 A Splash of Substance by Elizabeth Maddey is on sale for $0.99 through February 28! Click here. On Monday, Ginger Solomon invited Lynette Bonner to visit with us and share her latest release! On Wednesday, Deb Kastner encouraged us to dig deeper and explore themes in Christian romance stories! As an aussie one of my favourite places is Western Australia. I like Perth. I like the friendliness of people and there is so much to do there. There is a lot to see in the state also. The next place to visit I would go to Tasmania. I love the different areas and want to visit and see more of the state. Hi Narelle, what a fun ad that was!! We were able to get out for a quick mountain bike- good to get outdoors. Wow, Autumn already- thank God for a relatively quiet bushfire season! I am blessed to have travelled to a few amazing places in our country so it is very hard to narrow it down. I feel like there is loads to do and see (and eat!!) here in Victoria, as well as get a taste of the country. Australia really has somewhere for everyone! Here in Central Illinois we are looking forward to spring and nicer weather. Have had a lot of freezing rain this year. Anywhere with nicer weather would be a great vacation. Hi Narelle! In August 2016 my Book Club for Foodies read Bill Bryson’s travel log In a Sunburned Country about Australia. In addition to our lively book discussion, our local School of Cooking cooked a scrumptious Australian fest. Even though I have seen Indiana Jones many times, the ad made me chuckle. I would not enjoy the back country; I am a city girl. Therefore I would visit Sydney, Perth, Victoria, and Canberra and explore Australia’s beautiful coastline cities, vineyards, museums and eat in your delightful restaurants. Not a good week weather wise in Michigan and Northern Indiana. After receiving 15 inches (38 cm) of snow on February 17 on Wednesday (21st) we had 60 degrees F temperatures (16 C) and received 5 inches of rain in 12 hours. Our creeks and then our river overflowed. All the flatlands and many farms are flooded. The worst I have seen in 60 years. Fortunately the dam held. Yesterday felt like spring – sun shining and birds chirping / this morning the winds are howling. Welcome to Michigan. Part of the effects of living so close Lake Michigan (the 5th largest lake in the world). Best Wishes and enjoy your autumn. Hi Renate, Your Aussie itinerary sounds fabulous! I’m glad to see Canberra on your list :) I’m sorry to hear about the terrible floods In Michigan and Indiana. We had flash flooding yesterday that closed roads, flooded basement parking lots, and caused a lot of damage. Only the very low lying areas were affected. I hope Spring arrives in your part of the world soon! I have no idea what my dream vacation to Australia would look like. I’m a little afraid to venture out in an unknown place without a guide. I suppose if they do guided tours I choose to do that. I know I will never be able to visit Australia (age/health) so I will enjoy virtual visits through your posts/books and also the posts of Jenny, Wemble and other Aussies!! I do want to visit Australia, and I’ve got lots of travel guides there – a cousin, good friends from Hong Kong who emigrated there years ago, and a couple my parents entertained as visiting scholars here in California years ago. Also, I have family history there – my mother’s great-great-uncle went there from Switzerland and was in on the gold rush. My parents got to visit the area once and found distant relatives! Hadn’t seen that ad. I’ve always liked the idea of going to visit Australia. Not so sure anymore, but it looks to be a beautiful area. Australia looks like a beautiful place to visit. Just like Canada, I am sure that there are many different areas with vastly different ecosystems. I’m sure a person could spend quite a bit of time discovering them. I didn’t see the super bowl ad before now, but it is great. Hi Tammy, The ad is fun :) There are many places in Australia that I haven’t had a chance to visit! Australia and New Zealand are on my must see list. Honestly, I’m not sure how I’ll narrow down where to go though. I always love reading about it from you and our Aussie commenters – it helps scratch my travel bug a little. Hi Elizabeth, The time of year and the weather tends to be what sways people when they’re planning their itinerary. I hope you’ll have a chance to visit down under! I’d really like to see all of Australia, but especially the Great Barrier Reef and the Outback. When our children were young, we watched the series Five Mile Creek, which takes place in Australia. I would want to see the animals native to Australia so I’d choose a safari or zoo. Poor health keeps me from traveling much and I can no longer fly, so traveling to Australia will only be through books, movies, and tourism ads. I have seen some fantastic National Geographic and BBC Earth videos of most of the country. It is stunningly gorgeous! I saw the Super Bowl ad. It was funny, like a spoof of all stereotypical things from “down under.” I laughed when I realized it was just an ad and not a movie trailer. If I could visit Australia,Longreach,Queensland would be my first stop. My Dad was there in World WarII and he told us lots of stories. I think it would be great to visit Queensland. The reef also sounds like a beautiful place! It would also be nice to visit Australia to see all of the different animals than we have here. By the way, my mom lives in New Zealand (since 2001) so I’d more likely pop over there to visit…lol! Would love to visit Australia! Someday, when hubby and I can take a LONG extended vacation, we’ll go…. Australia would be such a fun place to go.